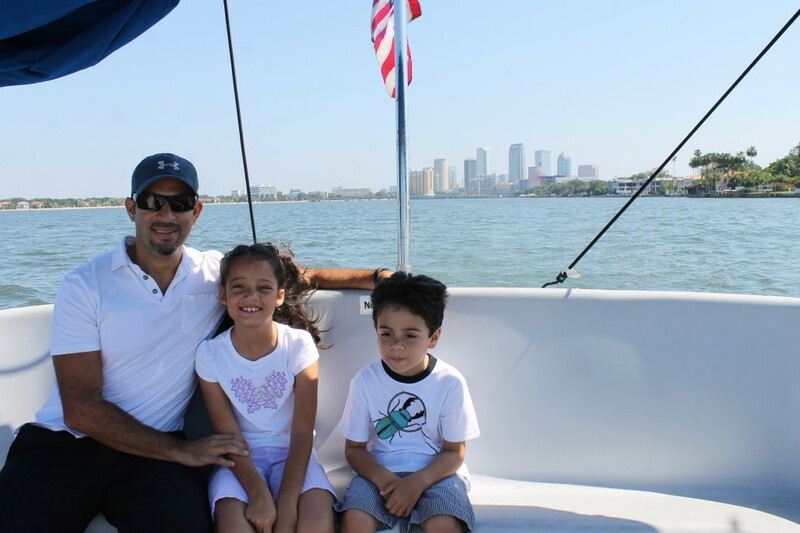 On our recent trip to Tampa with the kids we received free tickets to a sightseeing cruise aboard one of Tampa Water Taxi Co.’s boats. Cruising aroung Tampa on the Never Never Land. Photo: Paula Bendfeldt-Diaz. All Rights Reserved. Tampa is a one of the most picturesque harbors in Florida and it’s waterfront is filled with beautiful hotels, homes, museums, shipyards and many other attractions. As we looked for something fun and interesting to do during our family vacation in Tampa taking a tour of the city from the water seemed to be a wonderful idea. After seeing all the great reviews we decided to book a sightseeing cruise aboard one of Tampa Water Taxi Co‘s Never Never Land boats. We boarded the boat on the dock of the hotel we where staying, so this was really convenient and easy. We started off sailing on the Hillsborough river from where we got the best views of the University of Tampa, the Riverwalk, the Tampa Museum of Art and other interesting buildings and attractions. The kids where really excited to see the replica pirate ship, learn about the local wildlife and watch as other boats and sailboats glided through the Tampa Bay waters. 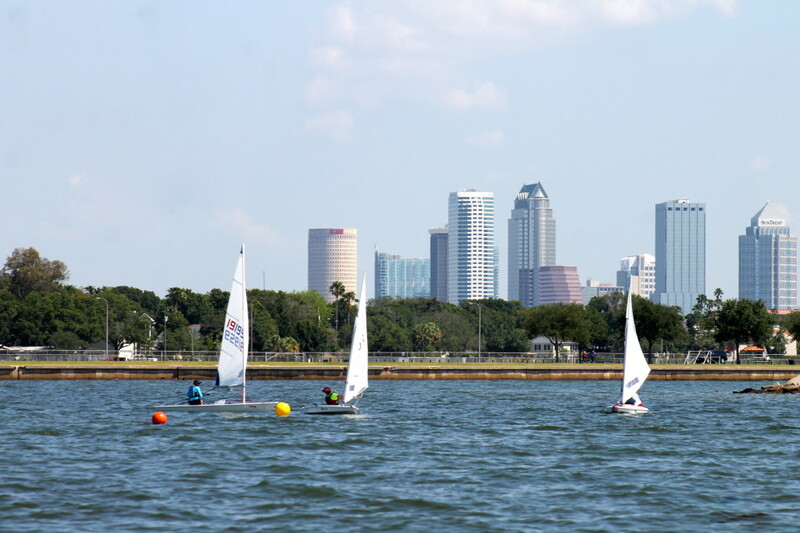 Sailboats on Tampa Bay with a beautiful view of the city skyline behind them. Photo: Paula Bendfeldt-Diaz. All Rights Reserved. We then went out into Tampa Bay where we sailed past Davis Island and had the opportunity to admire some of the most beautiful and largest homes in Tampa, including “St. Jetersburgh” New York Yankee Derek Jeter’s mansion. We thoroughly enjoyed learning about the city and it’s history as Captain Larry shared with us historic information, fun facts and interesting stories and anecdotes. He was knowledgeable, entertaining and awesome with the kids. We felt like we where being shown around the city by an old friend. We have been on other boat tours before and my children tend to get bored but this was not the case on this trip where the kids even got to steer the Never Never Land! 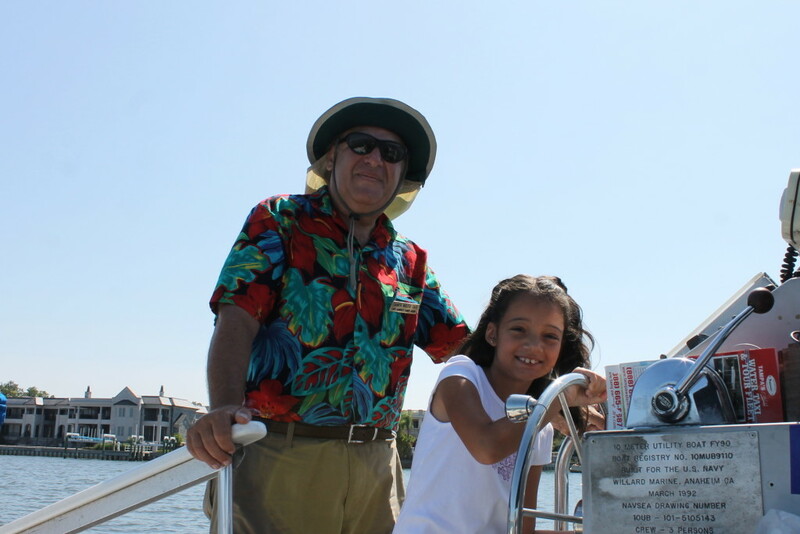 My daughter had a blast steering the boat with Captain Larry’s help and ecouragement. Photo: Paula Bendfeldt-Diaz. All Rights Reserved. 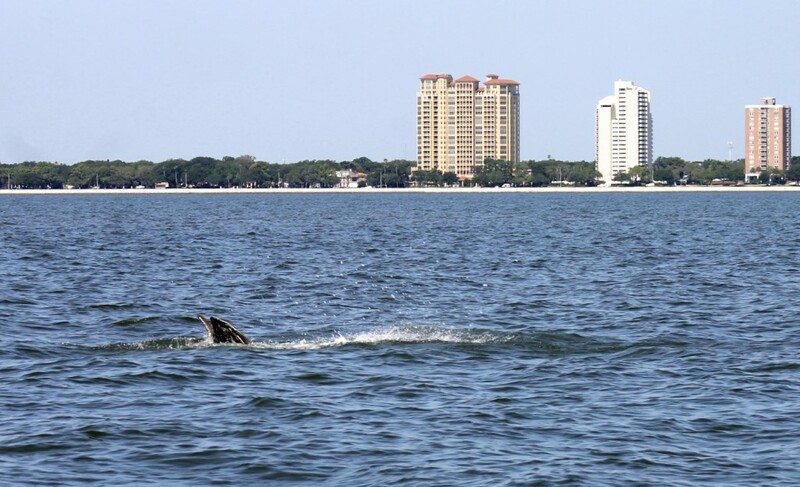 We had heard that on most of the trips you are able to spot dolphins who feed in the Tampa Bay. The dolphins played hard to get on this particular day and we didn’t get to see any but we did get the opportunity to see countless stingray couples mating. We live in Florida and see dolphins often but we had never seen stingrays mating, so this was pretty exciting. Captain Larry told us that in a few weeks schools of baby sting rays can bee seen everywhere. We will plan a trip during that time of the year in the future as I would love to see that! Sting rays mating in the Tampa Bay. Now you know how that looks like. Photo: Paula Bendfeldt-Diaz. All Rights Reserved. The tour lasted about an hour and during that time we got to enjoy some of the most beautiful sights Tampa Bay has to offer and learned a lot about the city. The experience was fun, interesting and memorable. I would highly recommend this as a great way to experience Tampa with Kids. View of the Florida Aquarium from the bay. Photo: Paula Bendfeldt-Diaz. All Rights Reserved. 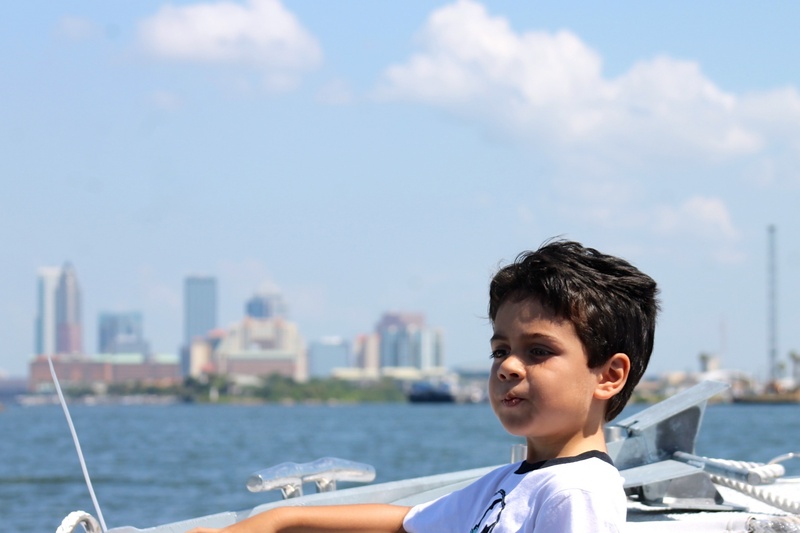 We took a harbor cruise but there are lost of other options including a sunset cruises, history cruises, eco cruises and a Pirate Treasure Hunt cruise for kids on Sundays. You can also arrange private group charters and point to point trips on the river to turn a regular dinner out into a special occasion. You can visit the Tampa Water Taxi Co. website or like them on Facebook HERE to learn more about their services. Disclosure: I received a complimentary cruise aboard a Tampa Water Taxi Co. boat. However all opinions are sincere and are my own. Celebrate at SeaWorld with a special Fourth of July Extravaganza and even more Summer Nights Fun! Wow!!!! Never thought of it! That is what we usually do too and we had so much fun discovering all the other things Tampa has to offer on this particular trip. I have to admit I am jealous! I love all your photos around FL. There is so much to do there, I would love to bring my family to visit. My kids love the water so its a perfect fit! These are some great pictures. It looks like you guys had a great time. Me transporté con estas fotos! Un días así es el que necesito! Que lindo paseo, Tampa es uno de mis lugares favoritos! Paula!!! Tus post me dan unas ganas de irme de viaje terrible!!!! Hermosas las fotos y muchas gracias por las recomendaciones ¡ojalá pueda ir un día a conocer!! Que bella es la Florida! You have some really great pictures! I have only been to the beach once and that was a few years ago. I would love to go again and take a tour like this. this looks like so much fun! I always loved doing harbor tours in Boston and I heard recently that Tampa is a super walkable city. We’ll have to go there someday! Que padrísimo …. de verdad que si hay cosas totalmente distintas y atractivas que hacer los 365 días del año. .. me encantan tus posts. I was in Tampa several years back and it is beautiful. We had a lot of fun eating Cuban Food and walking the streets but never went to the waterfront. Seems like a great place to enjoy a vacation.